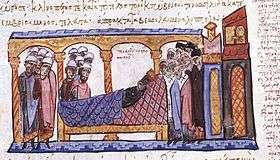 Constantine VII Porphyrogennetos or Porphyrogenitus, "the Purple-born" (that is, born in the purple marble slab-paneled imperial bed chambers; Greek: Κωνσταντῖνος Ζ΄ Πορφυρογέννητος, Kōnstantinos VII Porphyrogennētos; 17-18 May 905 – 9 November 959), was the fourth Emperor of the Macedonian dynasty of the Byzantine Empire, reigning from 913 to 959. He was the son of the emperor Leo VI and his fourth wife, Zoe Karbonopsina, and the nephew of his predecessor, the emperor Alexander. In June 913, as his uncle Alexander lay dying, he appointed a seven-man regency council for Constantine. It was headed by the Patriarch Nicholas I Mystikos, the two magistroi John Eladas and Stephen, the rhaiktor John Lazanes, the otherwise obscure Euthymius and Alexander's henchmen Basilitzes and Gabrielopoulos. Following Alexander's death, the new and shaky regime survived the attempted usurpation of Constantine Doukas, and Patriarch Nicholas Mystikos quickly assumed a dominant position among the regents. In 949 Constantine launched a new fleet of 100 ships (20 dromons, 64 chelandia, and 10 galleys) against the Arab corsairs hiding in Crete, but like his father's attempt to retake the island in 911, this attempt also failed. On the Eastern frontier things went better, even if with alternate success. 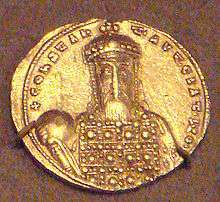 In 949 the Byzantines conquered Germanicea, repeatedly defeated the enemy armies, and in 952 they crossed the upper Euphrates. But in 953 the Arab amir Sayf al-Daula retook Germanicea and entered the imperial territory. The land in the east was eventually recovered by Nikephoros Phokas, who conquered Hadath, in northern Syria, in 958, and by the Armenian general John Tzimiskes, who one year later captured Samosata, in northern Mesopotamia. An Arab fleet was also destroyed by Greek fire in 957. Constantine's efforts to retake themes lost to the Arabs were the first such efforts to have any real success. ↑ Runciman 1988, pp. 47–48. ↑ Runciman 1988, pp. 49–50. ↑ Runciman 1988, pp. 49ff..
↑ S. H. Cross and O. P. Sherbowizt-Wetzor (trans.) (1953). The Russian Primary Chronicle: Laurentian Text. Cambridge, MA: Medieval Academy of America. pp. 82–83. ISBN 9780915651320. 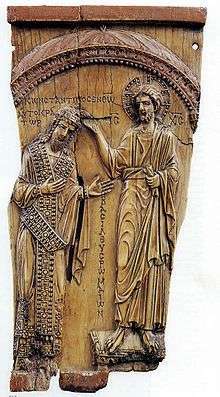 Constantine VII, De ceremoniis, ed. J. Reiske (2 vols., 1829, 1830). English translation 'The Book of Ceremonies' accompanying the Greek text in 2 volumes by Ann Moffatt and Maxene Tall, Canberra 2012 (Byzantina Australiensia 18).